Want to let loose in an Arnie moment when he was still young, did not bonk anything and everything in a skirt, and was the macho man in Predator? Then surely the Foam Dart Rotary Cannon will allow you to re-enact any scenes from the movies that feature a gatling gun in action, although the kind of damage that this puppy can wrought is painless and will be all in the name of good fun. This belt-fed cannon is capable of firing a barrage of 25 foam darts in just 20 seconds, although the real gun on a battlefield would spit out far more fiery bullets of death. Paying homage to the hand-cranked Gatling gun of yore, this relies on an electric motor and sprocket instead to advance a plastic ammunition belt. Each dart measures 2.5″ x 0.5″, and will be nudged into the firing chamber with a piston whereby it is then accelerated by a couple of motorized wheels down the length of the 9″ central barrel. The effective range? A rather impressive 20 feet, and you can use it in both defense and offence – to saturating an enemy fort or clubhouse with suppressing fire, or to mow down advancing forces. 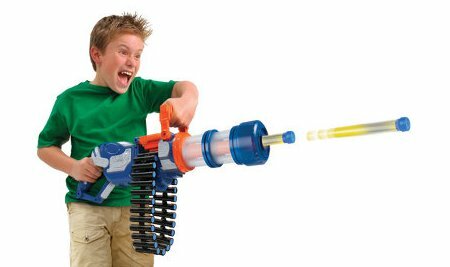 As long as you don’t run out of foam darts or drain the half dozen AA batteries, you’re good to go with the $79.95 Foam Dart Rotary Cannon.